Fantastic Oceanfront Beach House Perfect for Romantic Getaways or the Family! Important: Please scroll to bottom for disclosures and minimum stay requirements! This is a REAL Beach House! All the great views AND equipped like your personal home. This fantastic oceanfront home sits high on top of the natural dune; that provides panoramic views of the Great Atlantic Ocean! Upon arrival, step onto the deck, relax, don't be in a hurry, take your time and let all 5 senses take it all in. Relax, you are now officially on 'Beach Time'. Seaside Escape (SSE) is not like most of the other beach homes for rent. The beach is VERY private, no parking for the public, you only see a few people that own or rent the few beach homes. This home has a (1/2-acre lot) LARGE front yard with plenty of parking AND set back from the busy street! Across the road is NO homes, instead it is a 77,000-acre natural preserve. You want to hear the ocean, NOT the trucks passing by! Just like at home, when you stay at “Seaside Escape” you have a garage to use with and a remote door opener! To help get into Vacation Mode, this home has been professionally decorated, you'll definitely get a beachy feel! The fully stocked and spacious kitchen opens to the family room and overlooks the Atlantic Ocean. In the other direction (west) is the GMT National Reserve. The locals still call it Guana Park. Now it’s a Federal Reserve, it was a State of Florida Park for many years. The owner's suite has a deck with ocean views on one side AND a balcony on the other side with sunset views over Guana. The owner's suite also has a king bed, two large closets, TV, DVD, ceiling fan and its own beautifully decorated bathroom and the tub has jets. All of Vacation Quest’ properties have FREE High Speed Secured WIFI and the amenities that everyone wants! “Seaside” has a large stand-alone ice machine that makes those great small cubes. It also comes with a microwave, refrigerator / freezer, dishwasher, stove, toaster, coffee maker, waffle iron, crock pot, blender, mixer, and special touches such as aluminum foil, ziplock bags, plastic wrap, napkins and a new sponge. The combination living / dining room looks right out on to the ocean! It has wood floors, comfortable chairs, TV and DVD players, complete stereo system, and movies. The oak dining table seats six. There is also an area with a washer / dryer that’s stocked with all you need to do laundry. The upstairs guest bedroom (Bedroom #2) has brand new wood floors, 2 twin beds, large closet and a private screened porch directly on the oceanfront deck. The downstairs guest suite has a queen bed, futon, large closet, private bathroom and two separate entrances. The oceanfront deck runs the length of the home, with a large landing and a walkway all the way to the beach. There is a shower on the landing to rinse off after a swim. Also on the deck is a round 4-seat table with umbrella, or the many loungers and chairs. You work hard! You deserve to get away and enjoy some life away from it all for you and your loved ones; family / friends are treat yourself. Just think, you will; wake up to the sounds of the waves gently breaking on shore. Open your eyes and see the great Atlantic Ocean with the dolphins playing in the surf and the sail boats on the horizon. Grab your favorite cup of coffee or fresh juice, step out on the deck and just “take it all in!" Don't let life pass you by and later think of all the things that you 'should have'. With these specials perhaps now is the time... Think about it. SPECIAL NOTE for our disabled friends! This is a 2-story home with NO elevator! Disclosure 1: Pleased be advised that there is two empty lots next door to Seaside Escape, and one of them has been purchased and is now in the process of building a new home. We have a reduced the rate to reflect any distracting noises that may occur while construction is taking place, so this is a super opportunity to get an extra special price on a fantastic beach home! Seaside Escape is on an extra wide lot and with the sounds of the ocean it should reduce any potential construction noises and we expect little to no construction noise when you are on the beach. We have so far (as of April 17th, 2018) not had any complaints about the noise, so it shouldn't be bad at all! DISCLOSURE 2: Bedroom Number 3 (Queen bed and futon) This bedroom is DOWNSTAIRS, separate from the "main" living area of the home. The main living area, BR #1 and BR #2 are all upstairs, however the third bedroom is downstairs. BR 3 ingress and egress is downstairs to foyer, then across the garage to bedroom (and full bathroom). You do NOT have to go outside to enter or exit this bedroom/bathroom. However, here is also a door to the outside via a door on the south side of the home. I am the property manager, the owner is a wonderful person, I have the honor to be the manager. The home has been in the family from the beginning. As for me; I am a native of the Jacksonville Beaches / Ponte Vedra Beaches. Not just a native, but family going back to the 1600's in St. Augustine and Mayport FL In my teenage years I was a lifeguard and a member of the American Red Cross Volunteer Life Saving Corp, celebrating the 100th Anniversary in 2012. My parents owned a hotel in Jacksonville Beach also in my teen years. I LOVED the hotel business. After 18 years as an executive in the seafood business, I became a Realtor, owned and managed a RE/MAX Office, then an opportunity to get back to my first love, the hospitality business this time as a manager of vacation rental homes. It is so much more fun than the traditional real estate business. Seaside Escape is a very private oceanfront beach house. It is built on the top of the dune, so the views are better than most other beach houses. This is a beach house in the tradition of beach houses and it is private. The upstairs is all of the common areas (Living / Dining / Kitchen) as well as the Master and Second Bedrooms fantastic NEW wood floors AND with lots of windows to take in the fantastic ocean views! The living room has a sofa that opens into a Queen Sized Bed. Downstairs is the 3rd bedroom features new wood floors AND a full bath. Some would call it a 2nd Master or an In-law suite. This home has everything that you need for a fun vacation, TV's in all bedrooms and the living room. The entire upstairs is great ocean views and a fantastic deck with lots of space both in and out of the sun. Of course your own private boardwalk directly to the beach.. 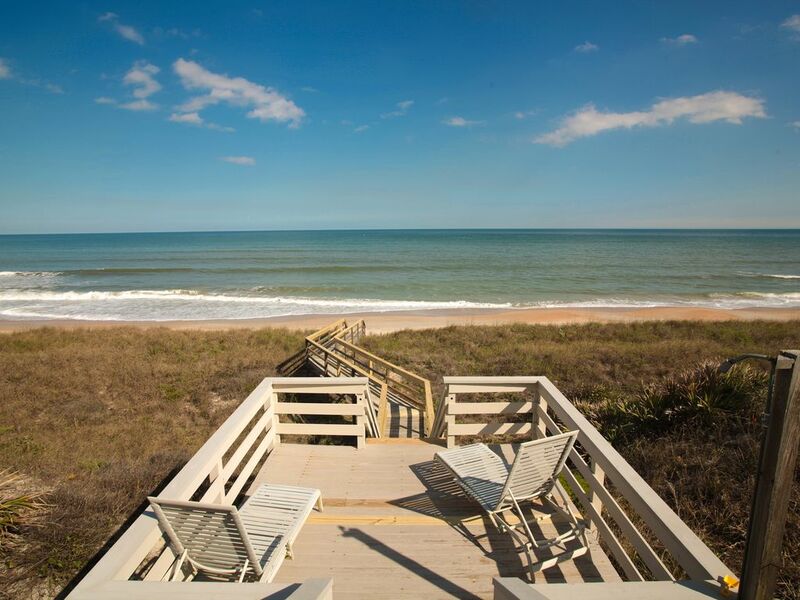 This is our northern most oceanfront beach house, so if the distance to Ponte Vedra or Jacksonville is important, it is a great location, The unique part is the privacy and the different levels of decks on the way to the beach. The screen porch off the second bedroom is not only unique, but if you are lucky to have a storm come in off the ocean while you are there, it is the very best place to see and hear it. You must experience that to understand, the other experience is a Full Moon Rise over the ocean! If you think sunrise and sunsets are nice, you haven't seen anything until you experience a Full Moon Rise! The back yard down the private boardwalk, this is an oceanfront home. YES! The very best waterfront possible, Oceanfront! The house is comfortable, attractive, and well maintained; cupboards are well-stocked with plates, glasses, etc., and appliances are good. With the ocean to the east and the wildlife preserve to the west it's a beautiful, peaceful location. Place is wonderful, house is confortable, clean, relaxing, luminous. Great holidays with family at Ponte Vedra Beach. We loved the location of the house on the beach - you can walk out the back door and be on the beach in 20 seconds! The beach was also great; secluded and only saw a few people. Lots of shells to collect on the beach. We will definitely be back! The home & location is perfect. The beach is practically private. The views are amazing. The home was beautifully decorated & well-stocked with everything we needed for our family vacation. Quality towels & bed linens, comfortable beds, nice beach umbrellas, beach chairs.... Seaside Escape has it all. Just bring your swimsuit & sunscreen & enjoy! We have no complaints, & when we return to the area, we hope to return to this same vacation home. A special thanks to Darrell and the amazing management team for ensuring we were happy & taken care of. We work very hard and comments like yours makes all the hard work worth while. You made my day! The owner is a big part of why Seaside feels like home! I'll past your review on to her, I know that she'll love your kind words too! Thanks SO MUCH for sharing your kind thoughts! Hope to see you again at any of our beach homes! Perfect....perfect and just oh so perfect! We loved everything about it. Charming and the location was spectacular. We will definitely be back. Thank you Daryl for all of your assistance along the way. You are a real gem! You and your group were absolutely wonderful! I truly appreciate all of your kind words. I hope that all of our future guests will be just like you! I agree that the location is perfect. It's like being on a private beach, yet it's only about a 10 minute drive to some great restaurants. We all here at VacationQuest. are looking forward to your return. the beach at anytime. We'll be back. Seaside Escape sits on the top of the dune, for the best views of all our oceanfront properties. The beach feels private, there is no public parking, so the only people on the beach either live in or are renting a beach home. It is perfectly located between upscale Ponte Vedra, TPC, Ruth's Chris Steak to the north AND to the south is historic oldest city in the USA, St. Augustine, FL lots of restaurants and bars, including the famous, Columbia with same owners and great Spanish food as the original in Tampa, FL. There are also 3 great restaurants BEFORE St Augustine, all less than a 10 minute drive.